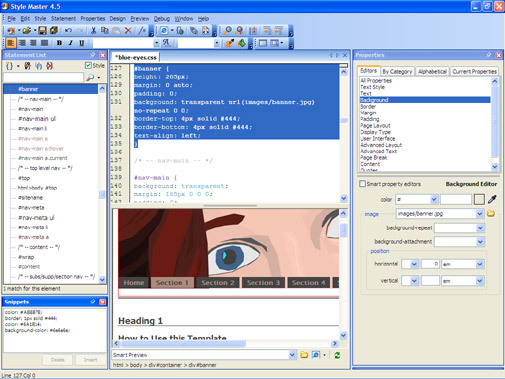 Style Master is a complete workplace for designing, developing and debugging your CSS. Design: WYSIWYG editors, advanced color picking tools and interactive previewing using the site you want to style - all in a fully customizable environment that will grow along with your CSS expertise. Build: Our collection of wizards and templates make it easy for you to create ready to go style sheets, navbars, breadcrumb trails, layouts and whole sites, without even having to look at the CSS until you're ready for it. Embrace the efficiency of CSS by linking to any number of HTML files from your style sheet. Code: As you learn CSS you'll find yourself using Style Master's hand coding tools more and more, but the editors will always be there for design tasks like creating color schemes, and getting to grips with new properties and selectors. Troubleshoot: CSS has some tricky browser support pitfalls. With intelligent built in browser support info, Style Master will help you avoid them. Our validation features make sure your code is always valid, our formatting tools keep your code looking clean, and our reporting features will even find any unused CSS for you. Learn: With a free CSS tutorial in the demo as well as a complete reference built into the application you can learn everything there is to know about CSS without even paying for the application! But as a bonus, we give you a copy of our Complete CSS Guide (usually $US24.99) if you purchase Style Master for just $US59.99.